I’d usually be inclined to think that a historically-important character like Vaevictis Asmadi should have a better title than “the Dire”, but I guess the problem is that his name is on the long side and that’s probably all they could fit alongside his mana cost! That doesn’t really take anything away from him, though. You can look at his game text as being suitably devastating for a character of his pedigree, or as simply causing chaotic and interesting things to happen in multiplayer games. I’d be careful about relying on it when you are behind on the table or have to get problematic things out of the way, as you can’t always predict what your opponent will get to replace it, but a lot of the time the worst you’ll get out of him is a 6/6 dragon. One whose colors overlap with Bloodbraid Elf, Kolaghan’s Command, and Maelstrom Pulse, no less. Chaos Warp on a stick. Well, not quite warping things and more blowing things up. 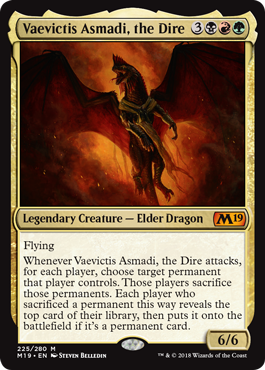 Vaevictis Asmadi is certainly impressive: the body is reasonably priced (6/6 with flying for 6 mana is definitely within reason), but that ability is where things get crazy. In both a good and a bad way. Vaevictis’ pseudo-Chaos Warp is an interesting effect, going off on attack and hitting everyone. You included. This means that you can swap out a chump creature for something more exciting and nuke an opponent’s troublesome permanent. The trade-off is that you might turn that troublesome thing into something more troublesome to your swoopy friend. Like a deathtoucher with flying or reach. It can be a risky gambit, but I think the upsides outweigh the downsides. I do think Vaevictis lacking combat abilities besides flying makes him slightly worse, but he’s still pretty solid in a game where you can protect him.